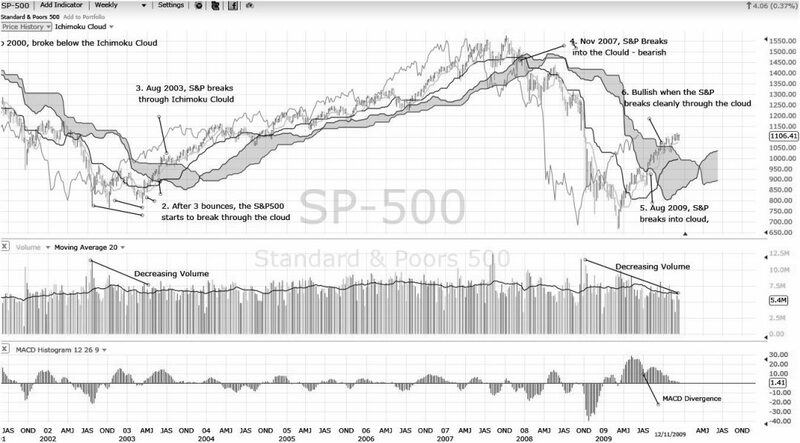 7 Point Plan to Use Ichimoku Cloud Charts to Analyze the Stock Market Direction & Make Better Forecasting Decisions. Clouds are great for a visually stunning view of the market. The Ichimoku Kinko Hyo is a Japanese stock chart indicator gaining in popularity. Ichimoku is different from other indicators as it enables you to clearly see the stock price trend, the momentum and pivotal points for price direction trend change. This visually impressive indicator calculates the equilibrium in a stock price’s demand and supply to help predict future price movement. Who Created the Ichimoku Cloud Indicator? Goichi Hosoda, a journalist, started work on the indicator in the 1930’s and 30 years later released it in his 1969 book. The name Ichimoku comes from his nick-name as his friends referred to him as Ichimoku Sanjin, which in English means “what a man in the mountain sees”. How is The Ichimoku Cloud Calculated? There are 3 configurable parameters in the Ichimoku Indicator. Tenkan-sen Calculation – (the average of the 9 periods high + the average of the 9 periods low) / 2. This forms one outline of the cloud. As the moving average line is 9 periods it usually forms the top of the outline of the cloud when the stock price is moving upwards. Senkou Span B Calculation – (the average of the 52 periods high + the average of the 52 periods low) / 2. This is the longer moving average and forms the other side of the cloud outline. This means that when the price is falling this forms the upper part of the cloud. Kijun-sen Baseline or Standard Period – (the average of the 26 periods high + the average of the 26 period low) / 2. This is very useful as adjusting this indicator allows you to control the offset of the indicator backwards or forwards in the future. Why Should I Use the Ichimoku Cloud Indicator? Are you wondering where the market is heading? This is exactly the point of the Ichimoku Indicator. The configurable parameters and the cloud itself is usually offset 26 days (on a daily chart) into the future. This helps to predict and prepare for trend changes. Essentially a really excellent tool for helping visualize a what stage the market or stock price is in. Sell Signal – When a price pattern enters and breaks through the cloud downwards from above this is a bearish sign. Buy Signal – When a price pattern enters the cloud from below and breaks out up through/above the cloud this is a bullish sign. Potential Trend Change – The Cloud can also indicate a good area of support or resistance. As price moves sideways near the cloud is can signal a change in momentum. Freestockcharts.com chart courtesy of Worden Brothers, Inc. I mapped the Chart back to the year 2000 so we can visually compare the last recession ending in 2003, with the 2008 recession. How does price compare with the Ichimoku cloud on both of these occasions? Is it helpful? The findings are extremely interesting! September 2000, the Price Bars broke through the Cloud resistance signaling a market in decline. The Market enters into a 3-year bear market, finding resistance 3 times in late 2002 and 2003. In August 2003 the S&P500 breaks out of the Ichimoku Cloud and moves vigorously into the New Bull Market. Moving forward to November 2007, the market enters the cloud from above and the ensuing Bear market takes hold. August 3rd, 2009 the S&P enters the cloud from below. this is a potentially Bullish sign, but can really only really be confirmed when the index breaks out upwards through the cloud and moves higher on stronger volume. On the volume pane (middle panel) we see that on both occasions the bottom of the market took place on reducing volume. We also see the MACD Histogram (weekly), has remained bullish since entering the cloud in 2009 as it did in 2003. When the Stock Price exits from the Ichimoku cloud upwards, crossing above the cloud, this is a very positive sign. When the Stock Price exits the cloud downwards this is a negative sign. When the Stock Price is in the cloud, this is a period of consolidation or essentially sideways movement. When the price stays above the cloud this suggests a continued up-trend. Ichimoku Summary & Further Reading. The Ichimoku cloud is an excellent way to visualize at what stage the market is in. Do you want the knowledge to invest with confidence? Buy the Liberated Stock Trader PRO Training Package and receive 16 hours of video lessons and the Liberated Stock Trader Book - fast forward your future. FUNDAMENTAL ANALYSIS - Learn how to analyze the health of the business climate and how to find great companies using our practical stock screening guide. TECHNICAL ANALYSIS – Chart Reading is not Voodoo, it is science. YOU will gain an incredible understanding of expert charting techniques, covering the most important methods, indicators and tactics, to enable you to time your trades to perfection. Next articleThe Balance Sheet – how to read it? Nice one, I'll check it out. Its Friday and I need more information about macd. Your post open a lot of different ideas in my mind. Good job. Regrads. Thanks for the post Barry, very informative post. 1. I am assuming ‘Ichimoku Cloud’ is an indicator? just like RSI that we can add to charts.. ? 2. 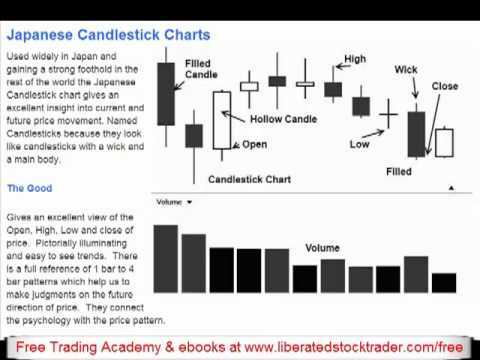 It is recommended to be used for daily charts, correct? 3. Same questions i had pertaining to your post on AD Line- i suppose it is an indicator that can be added from charting tools..? 4. Is there any specif parameter for these two indicators (AD Line & Ichimoku Cloud) before importing them to the charts? or it is standard? Hi again Arunav, let me answer your questions. 4. As with all indicators start with the standard timeframes, but then you can tweak the parameters to see which works best for you based. On your trading timelines. Good luck with your learning, you are on the right path. Thanks Barry for your quick reply.